Chester can rightly claim to be the most haunted city in England with impeccable paranormal credentials. 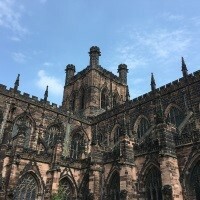 This unique tour includes two glasses of house wine each evening and a Ghost Walk in evening across the city to explore the eerie haunts of Chesters mysterious and murky past. Following collection from home, travel to Cheshire and the Best Western Forest Hills Hotel for a four night stay with dinner, bed and breakfast. Enjoy a full day in Liverpool. Why not visit Albert Dock for free time to explore this historic area full of shops and attractions, including the Beatles Story, Tate Gallery and Maritime Museum (entrances not included). Return to the hotel in time for a quiz or game of bingo this evening. Explore Chester today before an early dinner and this evening's guided Ghost Walk. Join a night-time ghost hunt around the eerie haunts of Chester's mysterious and murky past. Tour the ancient, walled city after dark, visit well-known spooky and scary places, and hear spine-chilling tales of ghosts, spectres, and things that go bump in the night. It's scary, fun and entertaining. Today, make a scenic excursion along the North Wales coast to the popular seaside resort of Llandudno and Conwy, with its quaint medieval streets. Travel to nearby Bridgemere Garden Centre, followed by the attractive town of Nantwich before the journey back to East Anglia. where the door to door collection service will be waiting to return you home. The Best Western Forest Hills Hotel is located in the town of Frodsham in Cheshire, with panoramic views from the restaurant of the surrounding countryside.